This is a later Scott Adams 12-pack (1989), also with the hint book, distributed by StarSoft. Founded by Hal McCrey, a lead designer at Adventure International, StarSoft was well-known for budget-releasing classic games from defunct companies (which AI was by that time), and published some of the last Apple and 8-bit Atari software sold in this country. This particular package contains the Apple, Atari, Commodore, and IBM PC versions, all in the same box. A blue box with the six S.A.G.A. 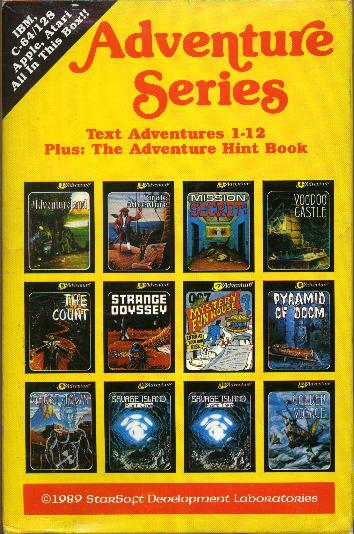 adventures (the ones with added graphics) also exists for Apple, Atari and Commodore, but not PC.